“If they gave out awards for acting with your eyeballs, Matt Crowle would have no competition whatsoever. He can throw ’em back into his head, cross ’em nine ways to Sunday and, in a particularly enterprising bit of comic business, make ’em dance in time to the music of Robert L. Freedman and Steven Lutvak. "Matt Crowle may just be the definitive Leo Bloom... I've seen many Leos in my time, beginning with the first one, Matthew Broderick... Truly, I think Crowle is the best of all... This won't come as a total surprise to anyone who saw his Patsy in "Spamalot"... Crowle, whose talents are insufficiently praised on a national stage, just layers in more precise observational beats... He's out there, but also real and vulnerable. Crowle's secret is his level of detail - one hilarious take after another... I cracked up all night at the Mercury Theater just watching what he was doing... Truly, a Leo to remember, Mel Brooks fans." "There is one major reason to catch this production, and his name is Matt Crowle... Crowle uses his brilliant comedic skills to perfection. In fact, forget about the role’s originator, Matthew Broderick. Crowle, a wiry actor and superb dancer — whose face performs a choreography all its own — has grabbed hold of Leo and made magic of every second of his stage time... He (and his pale blue security blanket ) give an award-worthy performance that I’m very glad I didn’t miss." "As Max Bialystock and Leo Bloom, Chicago clown princes Bill Larkin and Matt Crowle reign supreme." "For a show that has non-stop laughs, get to the Mercury Theater to see the two funniest players in Chicago: Bill Larkin and Matt Crowle as they manically lead the laughs in The Producers." "Mr. Larkin is perfectly matched by the outstanding Matt Crowle. After recently impressing as Albert Peterson in Drury Lane's Bye Bye, Birdie, Mr. Crowle makes this role all his own, another part seemingly written expressly to fit his talents." "...omnitalented performer, Matt Crowle, who was in the original Broadway production, makes a side splitting Patsy..."
"Matt Crowle winningly suggests spine as well as pathos as King Arthur's Beckett-like, wholly taken-for-granted sidekick, Patsy." "With spot-on comic timing, terrific stage chemistry (especially from Matt Crowle as Patsy), Spamalot unfolds as a swiftly moving musical comedy." "[Kortemeier] is ably supported by the brilliant Matt Crowle as his squire, Patsy. A Broadway actor resembling a young Tommy Smothers, Crowle possesses a bright, clear tenor, incomparable choreographic skills, and a winning sparkle and charm." "...the rubber-legged Matt Crowle as Cosmo Brown was particularly effective. Crowle is quite funny as he choreographed his own vaudeville tap duet, 'Fit As A Fiddle', plus the zany and cleverly hilarious 'Make Em Laugh', as well as 'Good Morning'. This is a breakout role for the amazing Matt Crowle." "The exceptional Matt Crowle gives a knockout, pratfall-filled solo turn in 'Make Em Laugh'." "...Crowle finds a charismatic through line and unpredictable life as a highly enjoyable Cosmo Brown." "Some of the best scenes happen when Crowle is on stage, including the hilarious 'Make Em Laugh' and 'Moses Supposes'. It's fitting that Crowle shares choreography credit - his impressive dance skills and wiry frame make him the perfect vehicle for slapstick." "Crowle is sensational, nearly stopping the show with 'Make Em Laugh', a number he also choreographed." "...Matt Crowle is outstanding and absolutely steals the show as Cosmo Brown...Crowle's Cosmo is a hilarious cross between Groucho Marx and Danny Kaye." "Crowle, who is this show's other major asset, fully catches the darkness of a role that should not be played as overly cheery." "[Rohm] is matched step-for-step, note-for-note by Matt Crowle’s sensational Bert. Mr. Crowle’s “Chim Chim Cher-ee” touches the heart, his aerial ballet during “Step in Time” thrills, and his charming production number with Ms. Rohm and the entire company, “Jolly Holiday” is unforgettable. These two actors create a magical duo that area audiences will not soon forget. Like Ms. Rohm, Mr. Crowle was born to play this part." "Perfectly hilarious...The performance I most enjoyed came from Matt Crowle who plays Hysterium but who knows that means he is to be anything but hysterical. Just twisted like a pretzel." "Crowle's 'winsome' drag sequence is perfection." "The funniest performances come from Bill Larkin as a wily slave and Matt Crowle as a panicky one." "As Hysterium, Matt Crowle demonstrates his great gift of physical comedy." "The production has another huge asset in Matt Crowle, who plays the comic off-lead, Luther Billis. He's generally a standard issue rascal, assigned to behave badly and create laughs. 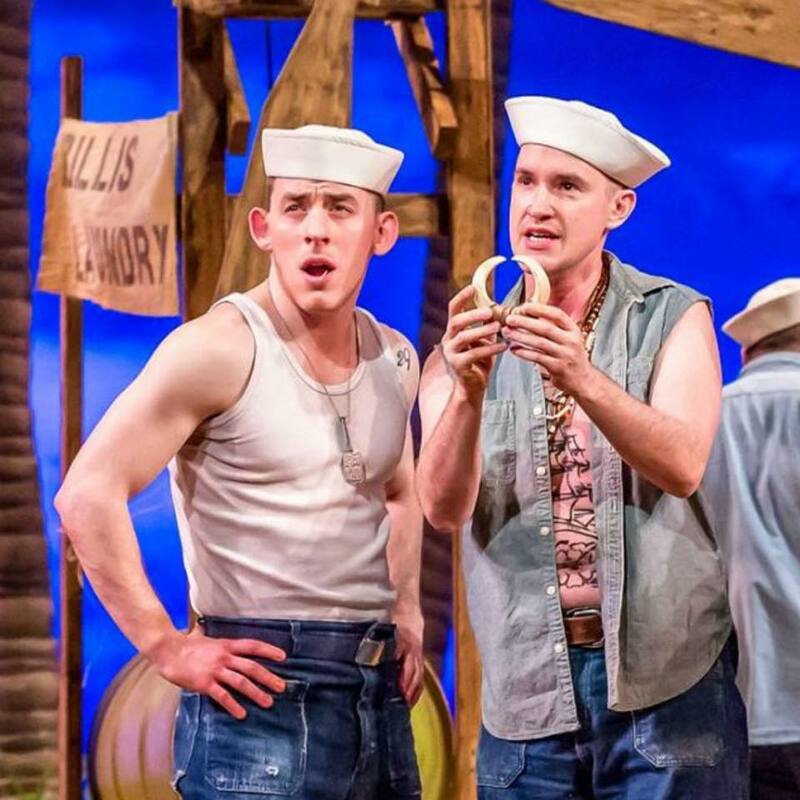 But Crowle, who is never anything but a live and thoroughly unpredictable presence on stage, shows you a whole inner life of a restless Seabee, far smarter than his own officers, that you don't usually get to see." "Matt Crowle's seabee, Luther Billis, is a masterclass in comedy. He provides much of the musical's lighter moments, but Mr. Crowle's character also harbors an edge that elevates him beyond stock stereotypes. Crowle fidgets and winces, connives and controls, delivering his lines with dry sincerity." "When it comes to comic relief, Matt Crowle deploys a number of funny flourishes as weaselly seabee, Luther Billis." "In the role of Albert Peterson, the nerdy music producer and mama's boy, is Matt Crowle, a lithe dynamo who moves like a dream." "Crowle is deliciously restless and entertaining...the production is quite witty, nicely sung and, especially when Crowle lets loose, injected with intermittent spark." "Crowle takes control of Dr. Frankenstein with a breezy intensity and focused charisma that holds together all the madness swirling around him." "Matt Crowle is a standout as Cornelius Hackl... Not only can he dance up a storm while keeping to his nerdy character, but he also later sings a ballad, 'It Only Takes A Moment', with moving simplicity." "...for crowd-pleasing schmaltz, it's hard to top Crowle's 'It Only Takes A Moment' valentine..."